IN THE MAY 2017 ISSUE – ON SALE NOW! PAST, present and future East Coast express trains lined up for a unique event north of York early on April 23. Virgin Trains East Coast (VTEC) was promoting the introduction of its new ‘Azuma’ trains in 2018, and teamed up with Welcome to Yorkshire, Network Rail and the National Railway Museum for the ‘Four Trains’ event, which saw No. 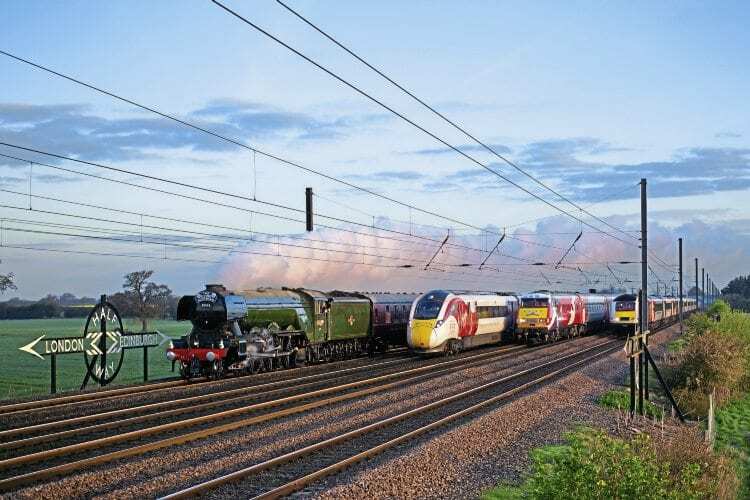 60103 Flying Scotsman run in parallel for several miles with three generations of VTEC trains – an InterCity 125, an InterCity 225 electric set, and a pre-series Hitachi Class 800/1. Having assembled in the early hours at Tollerton, north of York, the trains ran in echelon formation to Shipton-by-Beningborough for a photo call, pursued by television crews in helicopters. 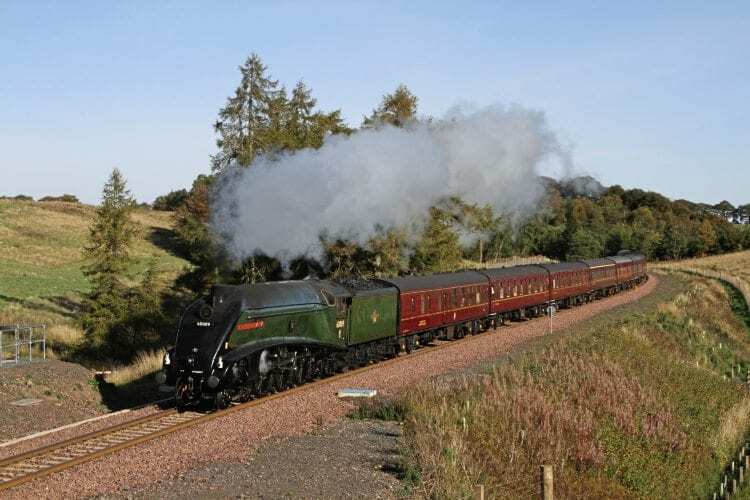 THE Scottish Railway Preservation Society (SRPS) will run steam trains over the Borders Railway on all four Sundays this August. The trains are being supported by Transport Scotland and Borders Council, and operated by West Coast Railway Co. They will start from Linlithgow and run via the Forth Bridge and Fife Circle, provisionally picking up at Dunfermline, Kirkcaldy and Dalgety Bay and Edinburgh Waverley before heading for Tweedbank. During the break at the south end of the line passengers will have the chance to visit local attractions such as Sir Walter Scott’s home at Abbotsford. The four trains will be hauled by a Stanier ‘Black Five’ 4-6-0 (subject to availability), likely to be drawn from the pool of three Ian Riley & Son locos being used on this year’s ‘Jacobite’ trains (Nos. 44871, 45212 or 45407). 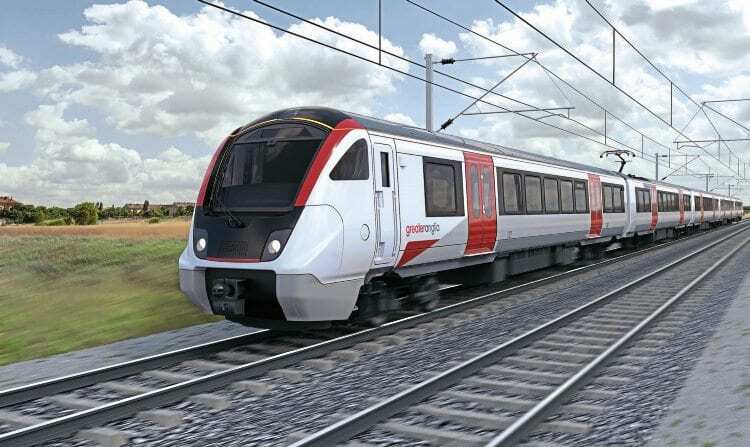 CLASS allocation has been completed and computer-generated images issued of how the new Greater Anglia (GA) Bombardier ‘Aventra’ and Stadler ‘FLIRT’ trains will look when they are delivered from 2019 onwards. An artist’s impression of the Bombardier Class 720 EMU that will work West Anglia and Great Eastern services. Interior and exterior views of the trains have been circulated to user groups and other stakeholders as part of a public consultation before construction starts. Passengers can also share their views on the proposed designs directly via the Greater Anglia website. The images give a clear idea of the internal layout of the trains, including areas such as vestibules and toilets, as well as proposed seating layouts, door positions and colour schemes. A revised GA livery of grey & white with red trim is also shown. THE Mid Hants Railway is seeking to top the Swanage Railway’s (SR) recent record gathering of seven Bulleid Pacifics (see p70) by showcasing no fewer than eight at its Summer Steam Gala. Just as at the SR’s Strictly Bulleid event the Mid-Hants will have four operational Pacifics in service over the July 1-2 and 7-9 weekends: Light Pacifics Nos. 34081 92 Squadron, 34053 Sir Keith Park and 34052 Lord Dowding (34046 Braunton) being joined by ‘Merchant Navy’ No. 35006 Peninsular & Oriental S.N. Co. THE flagship locomotive in the Tyseley stable – No. 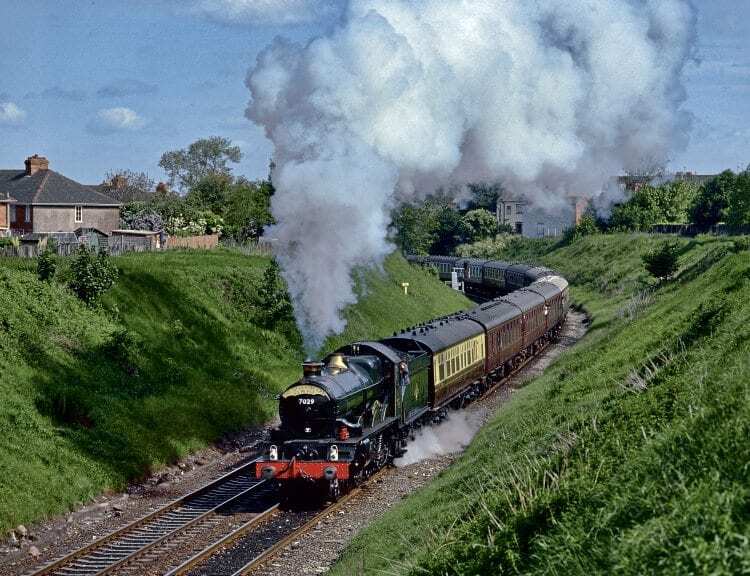 7029 Clun Castle – will make its post-overhaul debut at Tyseley’s special ‘Castles’-themed open weekend on June 24-25. This will mark 16 years since it last steamed and seven years since its overhaul began. The return of the BR-built Collett 4-6-0 this year is significant, coming half a century on from when the locomotive first reached Tyseley and set in motion the events that have resulted in today’s successful Vintage Trains and Tyseley Locomotive Works (TLW) operations (RM March 2017). The overhaul has been overseen by TLW’s works manager Alastair Meanley and may well be the most comprehensive that the double-chimney ‘Castle’ has received to date in its 67-year history. Read more on these articles – PLUS more News and Features – in the bumper 132-page May 2017 issue – on sale now!